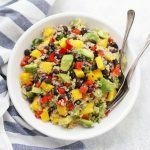 Confetti Quinoa Salad – One of my family’s all time favorite recipes, this fresh, colorful quinoa salad is perfect for picnics, potlucks, barbecues, lunches, meal prep, and more! In the years I’ve been blogging, I think this is the recipe my family (my sisters, mom, etc.) has made the most. It’s shown up at church potlucks, family get-togethers, vacations, holidays, and more. 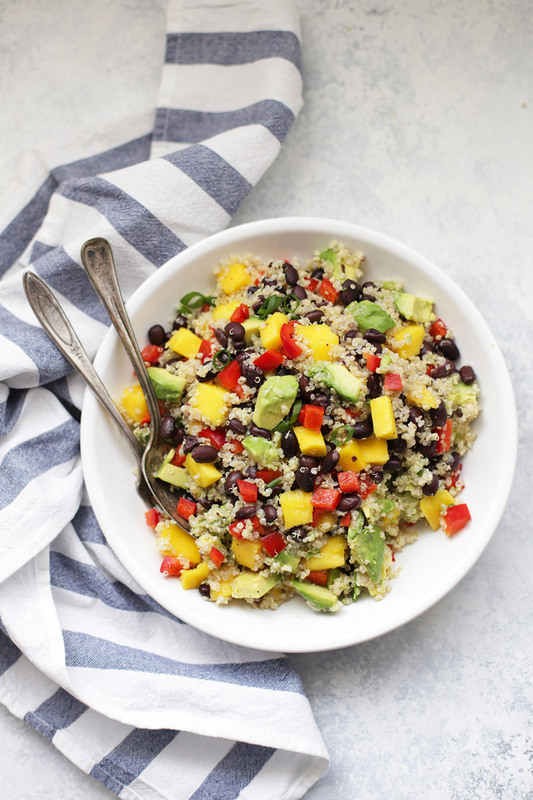 It’s everything good about quinoa salad–it has bright, fresh flavors, a delicious dressing, and it keeps well, which means you can serve it for a party or make it for a few days of healthy lunches. It’s a great recipe to bring to a get-together because it’s gluten free and meatless (easily vegan), so it appeals to a wide variety of diets. It’s filling enough that it can be a light main course, but also makes a nice, colorful side dish at a potluck, barbecue, or family dinner. It can satisfy all your guests without anyone feeling they are going hungry. I call it Confetti Quinoa Salad because of all the different colors flecked throughout. 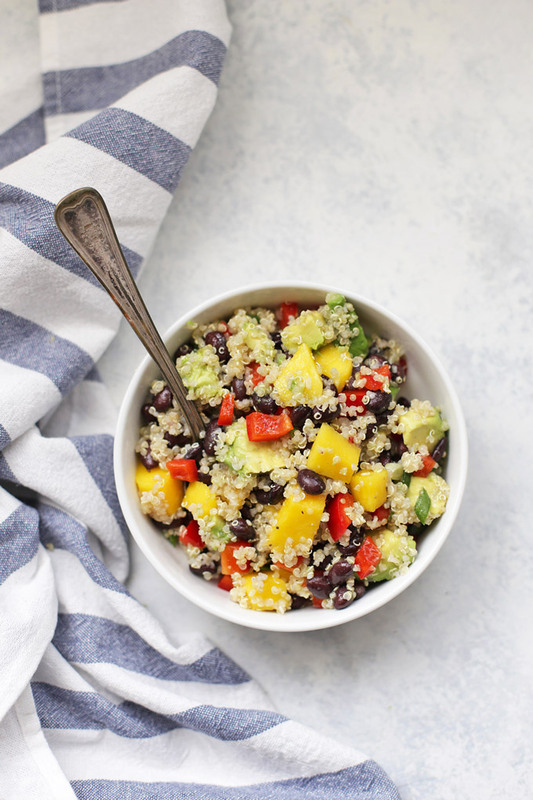 It’s got so much yummy flavor packed in there–from the creamy black beans, to the sweet mango, luscious avocado, bright bell pepper, and tangy dressing. With the weather warming up, this refreshing salad is sure to be one of your favorites! How long will this keep? It’s a little surprising (considering there is diced avocado in the recipe), but it’ll look fresh and vibrant for at LEAST 3-4 days, sometimes longer. the lime in the dressing works its magic to keep the avocado from browning. It keeps really well in mason jars (I don’t layer it–I just put the mixed salad in jars and screw on a reusable lid). Otherwise, just be sure to put it in an airtight container since minimizing the air will keep the avocado and mango from oxidizing. Change it Up. I’ve made this a LOT of different ways over the years–I’ve tried peaches instead of mangoes (it’s delicious), and I’ve tried adding a pinch of cumin or chili powder to the dressing, or finished things off with a little fresh cilantro. It’s pretty flexible! Don’t hesitate to play with the flavors. Honey, honey. Depending on how sweet your mango is, you may want to add a small drizzle of honey (or agave) to your dressing. It’s really nice with the added kiss of sweetness, but not always necessary. Follow your tastebuds! How do you cook quinoa? Your package will give you directions, but my favorite method is here. When I first started cooking quinoa 7 years ago, I didn’t rinse it, but these days, I ALWAYS rinse it before cooking. It removes some of the strong outer flavor and bitterness that can sometimes linger. 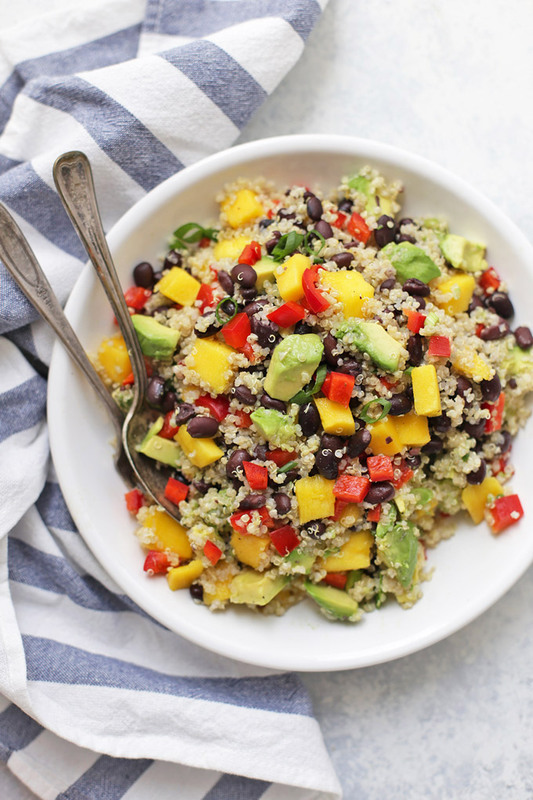 You can use any kind of quinoa you like here–red, white, or a tricolor mix. What if I don’t like quinoa? You *can* use cooked, cooled rice, or simply toss this mixture with greens for a fresh take. 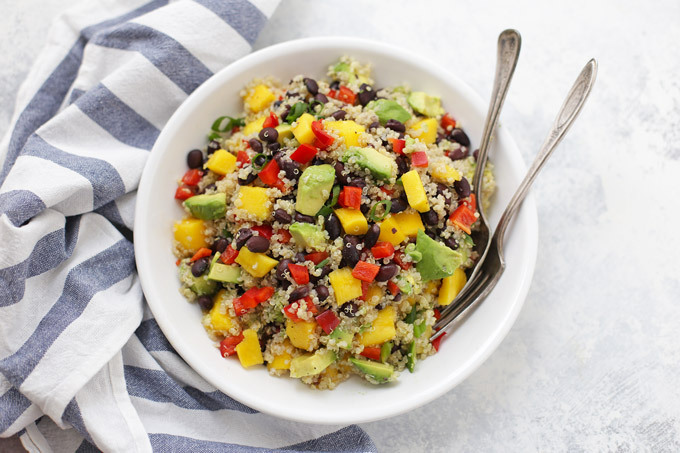 In a large bowl, combine quinoa, beans, bell pepper, mango, avocado, green onion, and cilantro. Drizzle over lime juice, olive oil, vinegar, (honey, if using), salt, and pepper. Gently toss to coat. Gosh, this looks so deliciously tempting! It obviously IS since you managed to get your mango hating husband to try it – and to LIKE it! If it tastes as great as it looks, we’ll have a new favorite salad at our house! I just made this to take to a potluck tomorrow. It tastes great! I’m a recent quinoa convert myself. Can’t wait to try this one! Because I also love black beans. Yum! I have nearly all those things right now, so I just might make myself some. 🙂 I love Biggest Loser!! I’m not a big reality TV person either, but it’s a lot more optimistic and way less dramatic than your usual reality show. I LOVE the back-story and seeing how everyone transforms into such happy, healthy people! Just found your blog through Tasty Kitchen and it’s beautiful – gorgeous photos! 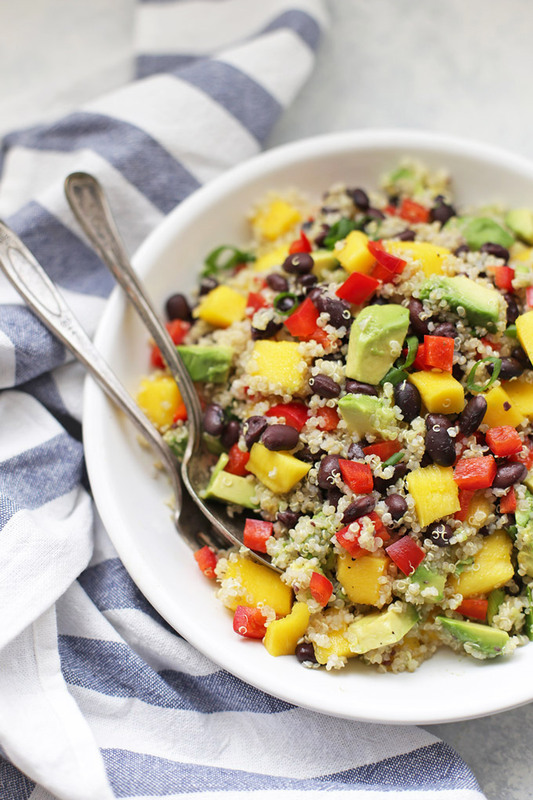 This quinoa salad looks delicious. What a beautiful creation! I can’t wait to try it! Help! I’m making this and realize I have no red wine vinegar! I have cider vinegar, rice wine vinegar and balsamic vinegar. Would any of these be a decent replacement? I think cider vinegar would be the best choice, for sure. Let me know how it turns out! Thanks! It’s delicious. Refreshing and slightly sweet. I’m in love. I used tomatoes instead of red bell pepper (because I was out) and they shined! My one year old even likes it! This was my first crack at quinoi – AH-MAY-ZING!!! I left the avocado out because I was packing it up for lunches for the week and didn’t want to risk it turning brown (despite the lime dressing). 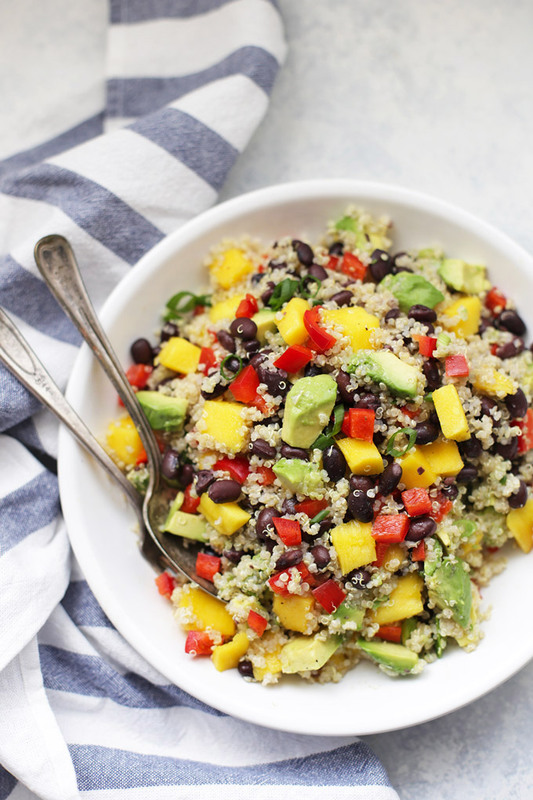 I can’t believe how much protein there is in quinoi – I’ve been missing out!! This is amazing! I LOVE it! Thanks so much for posting it. I just made this tonight and wooooooow. So delicious!!! Thank you for sharing! I’m so so glad you liked it! I just made this. I added cucumber, cherry tomatoes, garlic and little ground red pepper for some spice and it was absolutely delicious! Everyone who tried it loved it. I truly enjoyed this delicious dish! I brought this to a work potluck and was not disappointed! I was asked to share the recipe and did so gladly. This is a great go-to for lunch as well. How wonderful! It’s one of my go-to salads for potlucks and meal prep. It’s so good!